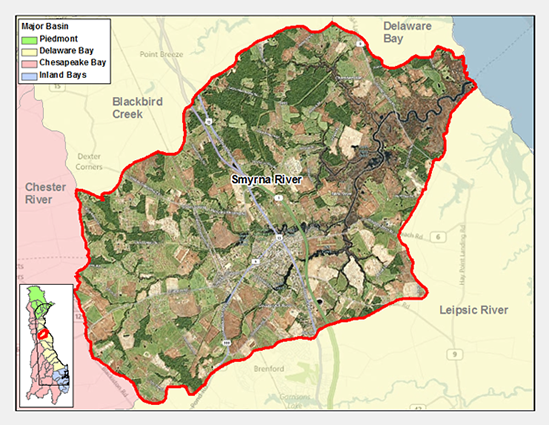 The Smyrna River watershed, located in the northeastern corner of Kent County, is bounded on the west and south by the Chester River and Leipsic River watersheds respectively, on the east by Delaware Bay and to the north by the Appoquinimink River watershed. This watershed extends north into New Castle County. The major water course is the Smyrna River which forms part of Kent County's northern boundary and New Castle County's southern boundary. The Smyrna River generally flows in a northeasterly direction. The lower ten miles are tidal. The drainage area of the Smyrna River Watershed is 64 square miles. 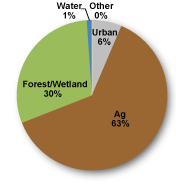 Land use is mostly agricultural. There are two incorporated areas in the watershed, Smyrna and Clayton. The nutrient and bacteria TMDLs for the Smyrna River Watershed require 40% reductions in phosphorus and nitrogen loads and 75% reduction in bacteria loads. The designated uses for the Smyrna River include primary recreation, secondary recreation, fish, aquatic life and wildlife, industrial water supply, and agricultural water supply in freshwater segments. The Smyrna River Watershed has fifteen sites listed in the Site Investigation and Restoration Section database. Seven sites are state-fund lead (HSCA) sites, three sites are in the Brownfield program, two sites are in the Voluntary Cleanup Program (VCP), two sites have undergone a preliminary assessment / site inspection (PA/SI) and there is one site National Priorities List (NPL) site. If you would like to view reports for any of the sites in the SIRS program please follow the link the DNREC Environmental Navigator to search by map for the Smyrna River Watershed.